Some chose to follow God. Others followed only fame and fortune. They lived through times of difficulty and times of triumph, through political and emotional turmoil, through popularity and through discontent. This ten-session LifeBuilder Bible Study focuses on the character of the Kings of the Old Testament and what we can learn from them. For over three decades LifeBuilder Bible Studies have provided solid biblical content and raised thought-provoking questions—making for a one-of-a-kind Bible study experience for individuals and groups. This series has more than 120 titles on Old and New Testament books, character studies, and topical studies. 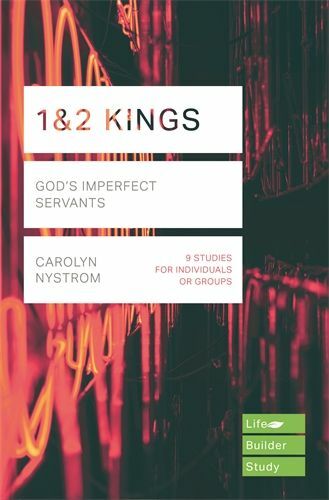 Lifebuilder Bible Study: 1 & 2 Kings by Carolyn Nostrym was published by IVP in May 2018 and is our 5452nd best seller. The ISBN for Lifebuilder Bible Study: 1 & 2 Kings is 9781783596751. Be the first to review Lifebuilder Bible Study: 1 & 2 Kings! Got a question? No problem! Just click here to ask us about Lifebuilder Bible Study: 1 & 2 Kings.